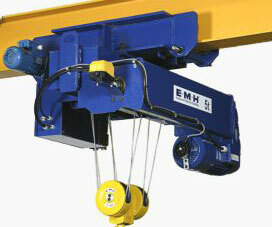 Wire Rope Hoists - Standard Packaged | EMH, Inc. Engineered Material Handling (EMH) sets the standard for wire rope hoists. 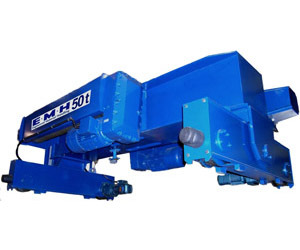 EMH manufactures its own single and double girder wire rope hoists for standard industrial applications, with standard capacities of from 2 to 50 tons. The EMH wire rope hoist provides a price to performance ratio that compares favorably with the best the industry has to offer. Standard features include two lifting and trolley speeds, two upper and one lower precision limit switches, overload limit, heavy duty wear resistant rope guide, DC rectified brakes, and lifetime lubricated bearings and gear reducers. Models shown are for standard speeds. Consult EMH for higher speeds. Product lines include: Type E Monorail Hoists for Single Girder Cranes, Type E Monorail Hoists Designed for Hazardous Duty, Type D Top Running Hoists for Double Girder Cranes, Type SU Monorail Hoists for Curved Single Girder Cranes , Type CM Cross Mounted Monorails for Single Girder Cranes, and Type Z Top Running Hoists with Dual Hoist Motors for Double Girder Cranes. Click to see Features, Advantages and Benefits of EMH Wire Rope Hoists.